Loss is a major setback and a sudden, unwanted change. Loss could be that of a loved one, of a job that is needed, or of a valuable possession. Grief is a natural reaction to any kind of loss, big or small. All of us face loss sometime in our life, but the way in which each person deals with it is different. While some individuals adapt to the changes and move on, some find it difficult to deal with the loss. There are 7 universal stages of grief, regardless of the coping mechanisms used. 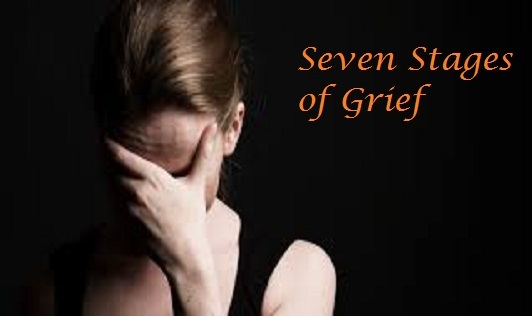 All individuals dealing with loss go through these 7 stages, not necessarily in the same order. Denial & Isolation: The first natural response to loss is denial. We refuse to acknowledge the fact that we have lost something or someone. It is a defense mechanism used by our brain to protect the human body from shock caused by such a major event. Because of the denial defense, the grieving person might seem uncaring. The person might detach himself from the situation and people because the person does not want to believe what has happened. Anger: As the isolation fades out, denial gets replaced by anger. The person starts feeling helpless, and out of control. Anger is often directed towards inanimate objects. At times, family members and other people also often get targeted. Guilt: Once the anger subsides, the person starts feeling guilty for becoming angry. The guilt is profound. It starts to get stronger as the person faces regret due to the loss faced. The grieving person often regrets not doing enough for the person or not trying hard enough. Bargaining: At a point while grieving, the realization hits that there is nothing under one’s control. The grieving person then starts bargaining. The person hopes for a chance to change the situation. There is a constant replay of the previous memories and situations. Imagining the situations differently, thinking what could have been said or done differently persistently takes place in this phase. Pain: When bargaining fails, the grieving person feels anguished. The mental agony is intense. While some people let this phase pass by crying it out or sharing it with their close ones, some people often take the support of alcohol and cigarettes to get over it. It is important for anyone to let this phase pass or to take support of loved ones to cope. Depression: The grieving person then becomes apathetic towards the entire situation. He/she feels extremely sad and empty. A sense of worthlessness takes over. There are disturbances in sleeping and eating patterns as well. The grieving person might seem to lose interest in life. Acceptance: Eventually, the person comes to terms with the situation and the feelings towards it. Acceptance is the last stage in the grieving phase.There is an acceptance of loss. The person then begins to deal with the changes that have happened due to the loss. Although, the stages are universal, there is no fixed sequence. It is important to remember that there are individual differences. Each person passes through the phases in a different pattern and each person takes different time frames to cope with the grief and loss. The time taken in each stage also differs from person to person. At times, people might relapse into previous stages before moving ahead. It is important to be patient with oneself during the entire grieving phase. Letting the stages pass is necessary for healthy coping. Help can be sought if one is finding it difficult to cope. Sharing emotions and thoughts not only relieves the emotional burden, but also helps to relax and gain new perspectives.This sharing process might help gain insight that can help one move ahead. Not seeking help, or depending on alcohol or other substances for coping is detrimental to physical as well as mental health.